With four on-site dining experiences including an award wining craft brewery, guests can unwind and enjoy locally sourced ingredients at Peet's Coffee, The Club Room, Jacks Monterey or Peter B’s Brewpub, Monterey’s original craft brewery. Our accommodations boast pillow-top mattresses, an array of helpful amenities, and the assurance of fantastic service by our professional staff. 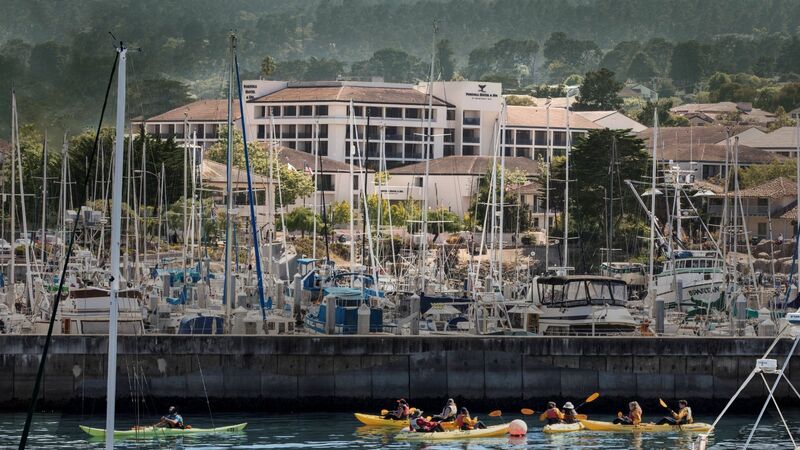 Portola Hotel & Spa at Monterey Bay features over 60,000 square feet of flexible event and meeting space and nearly 60,000 square feet of outdoor space overlooking the scenic Monterey Bay. From weddings, galas, and private parties to global conferences, business meetings and corporate retreats, the Portola Hotel & Spa is the perfect choice among hotels in Monterey Bay for group travel and full-service event planning, including catering and cutting-edge tech amenities. Portola Hotel & Spa at Monterey Bay is proud of its status as one of the first eco-friendly hotels in Central California, achieving LEED certification and promoting sustainable practices throughout our hotel, restaurants, and spa. Explore the colorful history of Monterey Bay as you marvel at the Monterey Bay National Marine Sanctuary and Monterey Bay Aquarium or visit literary landmarks like John Steinbeck’s Cannery Row. A stunning meeting of land and sea, the Monterey Peninsula also features an expansive list of family-run wineries, craft breweries, shopping dining, and sites such as 17-Mile Drive, Carmel by the Sea, Big Sur, Pebble Beach and more, just minutes away from the Portola Hotel & Spa. Click here to check availability and book your stay at our Monterey spa hotel today.